I've mostly been working away this week, it's been quite a few miles of travelling to Gloucestershire and Berkshire on the BMW GS1150 (Yes I know... my daughter never ceases to remind me I must be getting old, but I honestly can't think of a better bike to do this mileage all year round). 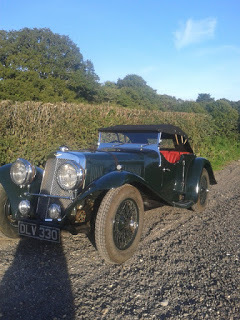 I started the week involved with a Bentley engine from the late thirties. This has been rebuilt by a specialist company that always work to very high standards. Although carefully run in on the road, unfortunately this engine has given many problems with piston ring and cylinder "bedding", through no fault of the builder. This is something that I have come across before and something that we are all at some risk of encountering during the restoration work of the older engines. 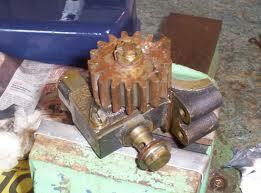 Some particular makes of aftermarket pistons and rings can bed very poorly especially with some cylinder materials. Experience and chatting to other builders can enlighten you as to whether a particular make might not be compatible but even then it can still cause many hours of worry. Whilst working for one particular engineering company we ran into real problems of a mismatch between a particular aftermarket piston and a particular pre war car model. Unfortunately we were caught in the middle, the piston company required the engine to remain stripped for analysis and the customer needed it together to keep the owner as satisfied as possible. The best option in this case was to have new rings independently manufactured and fitted, therefore the piston manufacturer never really had the analysis or proof of component failure. The correct running in procedure can also be critical. I have found an excellent article in the book "Four Stroke Tuning" by Alexander G Bell . The correct lubrication is important, however, you may see different scenarios. A newly built Morris Minor engine for example, may be filled with a reasonable quality oil and driven very carefully by a very conscientious owner/builder, only to have problems in bedding in. The same engine however, run on a dyno under a strict criteria might quite happily have bedded in, even perhaps on a very high quality oil. Incidentally, there may have been a "last ditch" rescue for the careful owner, that is the use of a very thin and aggressive running in oil for a short period of hard driving (Castrol Oils offer a very good helpline for this type of service). During my time with the engineering company,I would often judge the character of the owner of the newly built pride and joy and perhaps strongly suggest the use of a dedicated running in oil from the outset..
Back to the Bentley.... The engine, recently fitted with another set of pistons and with new liners was set up and run on the dyno through a strict sequence of procedures. Torque loadings indicated that the rings and pistons were bedding in nicely and the initial crankcase breathing fell to a minimum. We carried out a fuel air ratio check and checked all temperatures and pressures. Just for interest a power sweep was carried out showing a torque figure in the region of 220ft lbs and about 120HP @ 3800rpm ( I will not disclose the exact figures). Also this week I've continued on the restoration / refurbishment of an Alfa Romeo 6c, again dating from the late '30s and again at the customer's premises. The Alfa is such a beautiful car, not only it's stylish although flamboyant design. But also the engineering is to such a high standard, very expensive but very correct engineering, this is such a nice project in this way. I am currently involved reassembling the individual components of the suspension, each item having had any necessary engineering recovery work. The front suspension is full of little 3mm diameter needles, carefully built into units of such smooth and efficient operation. Some further finishing work on the rolling chassis of a restored Aston Martin 15/98 from 1937. Followed by the continued build/ pre build of the C.I.M.E. engine for an early to mid '20s GN. I have been fitting the piston rings on to the pistons, but first I've checked each ring to each respective cylinder and dressed the ring gaps carefully to size. Very time consuming..
You never really know what is around the corner. Whilst cleaning the upstairs of my workshop I picked up an old, unused, entry form for the Lands End trial. Reluctantly throwing it into the bin with a resigned tut! That was just a week ago. Having previously competed in single day, long distance trials, I have for a long time harboured the thought of competing in one of the historical long distance trials that are so much of our motoring heritage. Trials such as the famous Lands End, the Edinburgh and the Exeter Trial. I had always expected that I would compete on a motorcycle as that would have been a forgone conclusion. Meeting with a friend over the weekend suggests that I may well be doing one of these events but on four instead of two wheels! He has an amazing little car that is very much in the Lotus 7 family but shorter and a little taller. The "Troll" was, I understand, one of 19 or so made in Somerset, England. It is fitted with an ever faithful 1600cc "x" flow Ford engine and I think much of the transmission and rear axle is also Ford with perhaps the addition of some MG items. The chassis is a light weight space frame, the front suspension uses wishbones and coil over Spax units. This car isn't fitted with individually operated "fiddle" brakes that are sometimes used to allow traction and turning aid. Removing the detachable steering wheel and sliding into the tight snug seat I instantly feel secure and very much at home....although I will not be in this seat, I am destined to be the movable ballast and bouncer, as well as part time navigator and perhaps stand by motivator! Looking forward to the winter! Every picture tells a story, how this must be a great story! Thankyou to the Vintagent Blog/website (http://thevintagent.blogspot.com/) and D Walksler for this. I would like to share the two following videos. The Potteet Hot Rod is full of inspiration for me. Cars created by "Rolling Bones" represent an icon of speed history through the early post war years. It is strange how, compared to a typical VSCC special, you would think that a Saloon or Sedan family car would never be an aesthetically pleasing car by removing the bonnet / hood or removing wings / fenders and lowering etc.... But this is such a perfect car, as are so many of the traditional rods. This is a video that I often play in "loop" mode and drift off to sleep at night, helped by the dreamy choice of music, well two tracks at least! The video of the Mors is also an insight into such a raw and brutal machine, again capturing the appeal of putting a huge fire spitting, chassis flexing engine into a primitive and very light chassis. The engine is a Curtiss OX5 ( I think) normally at home in a 20's aircraft, barnstorming it's way across midwest America. The whole "mechanism" of this car is so appealing! Hope you enjoy these as much as I have. A Story to Smile At....Coventry Eagle. Fifteen years ago a workmate told me a good story that I would like to share:. He was attending a Merchant Navy engineering college in the late 70's, many of the young students were using FS1E Yamahas, Honda and Fantic 50cc sports mopeds. Just as the "scooter boys" of today I can imagine they felt pretty "top dog" and invincible. One particular lecturer used a Coventry Eagle, V twin, very similar to a Brough Superior. As a frequent mischievous episode, the moped perils would come alongside, hunch over the handle bars in a racing gesture. They would taunt and then roar off, gesticulating at the "old boy"on the "ol bike" of course showing him how to really ride! Except this day, the old boy loped along, the perils staged their predictable theatrics and roared away.....but approaching a great speed of 60 or 70, they were shocked to turn and see the Eagle alongside! The dead pan moustached face leaned across a little, the pipe casually removed and precisely tamped on one FS1E handle bar to empty a few embers. Then replaced in the shadows of the pudding basin. A staccato effortless exhaust roar later and the Eagle was far ahead, was that a wave from its majestic rider? Certainly he raised his hand to acknowledge something! That night tucked up in it's familiar shed, surrounded by newspaper cuttings, dusty trophies, faded leafy laurels and oil soaked benches. The old Eagle slept a little more contentedly. Motorcycles have taken such an important place in my life. Originally forbidden to have a motorbike, although my older brothers had enjoyed them in their teenage years. 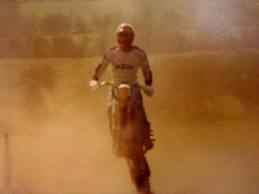 Having had a taster of "Fizzies and Fantics, Gileras and Garellis" scrounged from college friends, I bought and began a bit of a clandestine relationship with a Maico 440! Steep learning curve too! Over the following years motocross became my life. 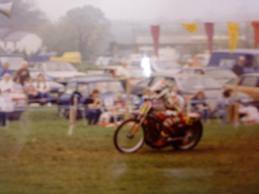 As age and a recurring right leg injury imposed into this relationship, I tried my hand at all sorts of competition including sidecarcross, enduro, long distance trials and grasstrack with a 500 Antig Weslake. The Weslake finally broke a con rod with catastrophic results to the engine. All of this time my girlfriend had accompanied and supported me without missing a single meeting. This was the perfect time to get married and leave the racing for a while. Years later I began to think about returning to some form of motorcycle sport. Having always been intrigued by speed records and design, it was time to look at a new project. Lots of pondering over Christmas 1986 gave me a chance to do some drawings and chat to friend and sidecar racer /builder (and to me certainly, " a legend"), Trevor Ireson. We spoke about problems and solutions, Trevor quietly guiding me. It was my aim to self build as many parts of the bike as possible and to try to capture something of the historic sprinters and racers of the early years. The steel tube was ordered and nickel bronze rod obtained.. The bike continued to grow over the next few months. Some of the traditional styling has been compromised by modern regulations. Also a mistake by me gave a little too much steering rake. 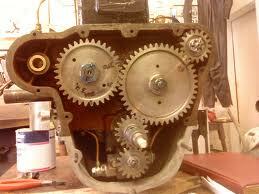 I used a second replacement Weslake 500 engine and the gearbox from my grasstrack bike. The intention was that a supercharger would be made from drawings I had produced earlier, but for now the engine would remain normally aspirated. The rear wheel/ tyre is probably too wide, but considering the supercharging at a later date and the difficulty of obtaining the old, narrow rear sprint tyres, I decided to stay with this combination at this stage. The front end came from an old Honda CB 200 frame, found in a ditch near a friends house, miles from anywhere. A new rim, spokes and tyre and lots of polishing sorted this out. First tests show that I was too optimistic in trying to use the two gears of the Antig gearbox. 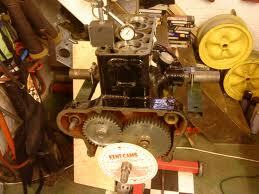 A third gear was grafted into position. The times have been in the region of 12/13sec 1/4mile and about 110/115 top end speed but still requires lots of refinement to make things more seamless.. The fantastic arrival of our children and becoming self employed, has postponed my adventures and I am guilty of saying "next year" as each season goes by!..... Maybe next year! The name "Mistress Quickly" is from a Shakespeare "lady" inn owner and friend of "Doll Tearsheet". This bike became something of a mistress, as I arrived in at 3 in the mornings and concentrated on nothing else! The painting was an excuse to emulate the wartime art of the American bombers and fighters, along with the simple and raw unpainted aluminium and steel finish. In the corner of my workshop, there is a little piece of motorcycle history. Often overlooked by everyday urgency, meeting of deadlines and ensuring that projects conform to the "end of the month" customer expectations.It just needs a prompt from a visitor's unwitting comment, to remind me how lucky I am to be in the company of a.... 1930 Dirt Track Rudge. This old racer sits quietly like an old boxer. A little battle scarred, a little attitude, but still "hard as nails". You know that should you mix it up and go down the track with this pocket size bare fist fighter tumbling after you, it is really going to hurt. The Rudge has a four valve 500cc Alcohol engine, not too far removed from its modern day cousins. The sharp, abrupt noise and Castor smell from the two port exhaust pipes shouts that you can only be on a speedway bike. Childhood memories of Swindon speedway nights on my big brothers shoulders, will always be immediately summoned. The unforgettable words from my hero and legend Barry Briggs " Yer pen don't write mate" as he hands back a Swindon programme without even a smudge! And the proud memory of cycling to Swindon rider Mike Keen's workshop and earn 50p cleaning his bib, leathers and boots. My Rudge has Swindon connections too, It belonged to Swindon rider, captain and coach, Bob Jones.I am not too sure if Bob raced this bike in his early days, more likely it was his second bike for demonstrations and commemorative events, certainly Bob had another, possibly more original bike. I will not restore it, but it is my duty not to let it deteriorate. Apart from a suspected fault as the magneto warms up, the machine starts and runs very nicely. Riding it is as you might expect, something of a time travel experience, very quick too, even by modern standards. Scarier than a lap on a modern ish grass bike, I always feel its physical, hard steel form, will not forgive you for any mistake. However I am sure that I would be proven wrong after many exciting races. Productive day and a bit of a grumble! Just arrived back from a couple of days subcontracting. 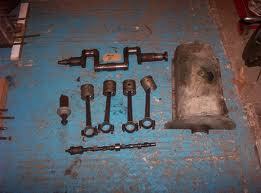 Had a productive time sorting out some last "fiddly" bits on an Aston Martin 15/98 chassis (1937). This is close to becoming a rolling driving chassis after lots of work bringing it back from a pile of rusty dismantled bits that had been exposed to the elements for many years. Also in one particular place that I have been working, I overheard a comment that really annoys me! The comment came from one of a team of, I presume, highly qualified development engineers working on a very new automotive project. It seemed to be a continuation from a discussion about traction and torque when the following statement was made. "Well one motorcycle company have been using a four cyl engine that fires as two cylinders instead of four, supposed to help traction, I find it best to take all motorcycle engineers with a pinch o salt, they don't seem to know what they are doing"!!! Their words entirely.... how can someone of that calibre make such an incorrect, sweeping and arrogant comment? There was even more of a poetic twist in the tale later in the day, but I cannot comment on this. I also heard a similar statement from a mature student toward the end of my engineering studies. He was very bright with the mathematics side and worked as an engineer with a large international aircraft company. We had to do some in depth studies on the subject of torque and materials. As a quick reminder, the lecturer sketched on to the blackboard, a very brief diagram of a spanner on a nut held by a hand at the opposite end, followed by the very basic initial torque calculations. As the sketch was completed the particular student and his group of followers stated loudly " what do we need a picture of a spanner for, we are engineers not grease monkeys"
I started as a grease monkey and worked many hours of extra time in eve classes and part time releases to get to this particular level. Also many of our greatest engineers in history started from the bottom, getting their hands dirty, before moving on to great things. Both of the above comments deeply annoy me. I will not forget them, especially when I see a component that has failed..... because of a fundamental design fault..... not to be confused with a normal human error/ mistake that we all do from time to time. Soap box is away now, sorry for grumbling! I really enjoy looking in on other peoples projects, not just for the project but also the environment it's in. I suppose I just like being nosey, many workshops are shrines of interest in themselves...have you seen the opening shots in the "Worlds Fastest Indian "movie? The blog/website http://thevintagent.blogspot.com/search?updated-min=2010-01-01T00%3A00%3A00-08%3A00&updated-max=2011-01-01T00%3A00%3A00-08%3A00&max-results=50 is really worth a visit and has an "Other peoples garage" section. The following photos are of my own workshop, I will update these from time to time. The C.I.M.E engine has been a particularly interesting project. The engine is built by the French "Company of Industrial Motors and Explosions". (what a name for an engine company!). 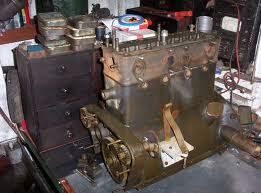 Dating from the mid 20's, this engine is destined for a GN cyclecar of a similar period. We started with boxes of bits from four engines (this is probably a very large percentage of all the surviving engines). 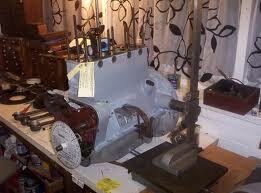 Careful selection and contemplation over many hours has produced an engine that is nearing completion. There are a few details to finish including the manufacture of some new gear journals in the timing case and completion of the modifications to the oil feed system. All modification we carry out, will always be in keeping with the spirit of the particular period. This means absolutely no Nylock nuts or plastic oil lines etc. The pictures show the engine during the current dry build. This is the first time many of the new components have been fitted. The bearings are white metal, pistons are made from my drawing by JE Pistons.... very good service and quality too! I have just collected all items from balancing. The clutch arrangement on this has been particularly finicky to balance. The pistons and rods are all trial fitted. Big end bolts tightened to a particular stretch and clearance re checked. Currently the clearance of the oil return scroll in the front cover and the gear journal to cover clearances are being checked and dimensioned. The Historic Engine Co.(http://www.historicengineco.co.uk/index2.html ) is my small business based in a quiet and pleasant seaside town on the south coast of England. I am lucky to be able to say that my work overlaps with my hobby and passion of historic engineering and design and just plain making things! Many of the projects are unusual and rare. These often require quite an element of reverse engineering and the re manufacture of missing items. If you have an interest please have a quick look at this blog as I share some of the weekly problems and fixes that I may come across. Some of the projects have a very tight budget, others are at the other end of the scale, this can often be an influence on the decisions we make on how to carry out recovery. The American county fairs became a welcome break and moment of perhaps escapism from the austere, hard and stomach knotting worries of the depression years in the midwest states. As well as the typical sideshows and horse racing, the introduction of car and motorcycle events on oval dirt tracks became increasingly popular. The competitors would often lead a gypsy or barnstorming lifestyle, travelling from fair to fair with little more than the racecar loaded with a canvas cover or tent. Essential tools would be secured in a box along with minimal spares. A hand gun or similar might also be concealed, just incase, on those nights camped alone in the middle of nowhere! Perhaps a bale of hay or straw might be puchased at the event to provide that luxury bedding beneath the ground sheet. The cars where not particularly regulated or acceptedby the motorsport officials of the day, hence the "Outlaw" tag. Safety was minimal and serious accidents were very common. Many racecars started life as a cheap or discarded old Ford or Chevy. Chassis' were modified and primitive bodies constructed. However, intuition and innovation led to many clever modifications and developments that are still in evidence today. Some self taught engineers developed new pistons, con rods and very ingenious head and valve modifications, all with very limited resources and equipment. The car under construction in the pictures is typical of the late 20's to early 30's. Based on a Model T chassis which has been shortened considerably and inverted. The left rail has been joggled outwards just after the firewall. The driver can then sit very low between the propshaft and chassis rail. 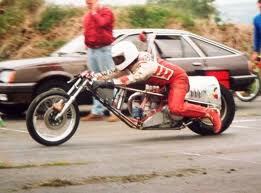 Positioned at an angle, his right leg stretches over the prop shaft to the throttle and a sturdy foot bracing section. As the car sets into a sideways drift, the driver can anchor himself firmly and feel the little tell tale movement that will dictate the next turn on the steering or slight lift of the throttle. The engine is a 29 Model A Ford, fairly standard except for an increase CR and some valve modifications. The rear suspension is 1/4 elliptic and the front will be Model T but with the axle forward of the crossmember and spring (not yet in position in the photos). The radiator is an aftermarket item of similar period. The wheels will probably be amongst the last items of the project, but we will have large diameter and thin section (similar to the motorcycle ones currently in the photos) to achieve the "spidery" look of the period. Still lots of work to do but i will keep posting as I progress. The first page of the "Historic Engine Co" blog. The intention is that there will be some rolling update and discussions of projects on the go in the workshop. Also my own hobbies and interests will sneak in too. Thank you for looking in!